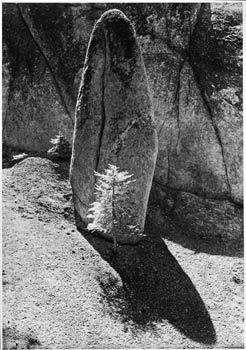 Granite, Hemlock Tree, High Sierra Near Matterhorn Canyon, Yosemite National Park, California, copyright 1950 Philip Hyde. One of those darkroom printed in 2014 by David Leland Hyde and Stefan Kirkeby. In October 2013 and January 2014, David Leland Hyde and Stefan Kirkeby darkroom hand printed brand new contemporary silver gelatin prints from Philip Hyde’s best vintage original negatives of Alaska, Grand Canyon, Glen Canyon, the Redwoods and Point Reyes. In October Hyde and Kirkeby printed 10 images for a total of 62 contemporary prints and in January they printed six images for a total of 28 prints. In most cases, the vintage prints of these particular negatives are nearly or all sold out. More importantly, with these new prints, the public can obtain darkroom prints in the same tradition that Philip Hyde made his own, with much less outlay. The black and white estate prints made by Imogen Cunningham’s heirs are valued at $2,500 and the contemporary black and white prints of images by one of Philip Hyde’s classmates, William Heick, are priced at $1,800. The contemporary darkroom prints of Philip Hyde’s top black and white photographs are valued at only $1500. As soon as the new silver prints begin to sell in any one image, the subsequent prints will go up to $1,800. Stefan Kirkeby has helped other black and white photographers make new silver gelatin prints including Golden Decade photographers Stan Zrnich, David Johnson, William Heick and the heirs of Don Whyte, Benjamen Chinn and many others. “We used Ilford warm tone fiber-based paper,” Stefan Kirkeby said. “It contains the most silver of all Ilford papers. That’s why the prints have such beautiful warm tone blacks like Philip Hyde’s prints from the 1940s and 1950s.” At Stefan’s darkroom in San Rafael, we used a Durst Laborata 1200 for the 2 ¼ and 4×5 negatives. We also made some contact prints from two of Philip Hyde’s early 8×10 negatives: “Looking Down Merced River At El Capitan” and “Aspens, Conway Summit” that appeared in This Is The American Earth, the first book in the Sierra Club Exhibit Format Series by Ansel Adams and Nancy Newhall. For the 5×7 negatives we rented a darkroom at Rayco in San Francisco where they had a Durst 8×10 Enlarger with a 5×7 easel. Have you ever been in a darkroom or made silver gelatin prints? Thanks for the comment, PJ. Yes, it was all vaguely familiar of course. I watched my dad do it over and over a million times. I used to hang out with Dad in the darkroom while he was printing quite a bit. I told Stefan that he was the only other person I’ve ever done darkroom printing with. As you know, my father learned to print black and white from Ansel Adams, Minor White and Edward Weston, but I was very favorably impressed with Stefan’s facility in the darkroom. He is also a master printer, adept doesn’t begin to describe it. I rocked the trays, took my turn at most of the other steps and helped with adjustments. He left all the primary creative decisions up to me, but I always asked his opinion too. We worked well together in that setting. I have seen the making of silver gelatin prints over and over, but if I tried to do it by myself, I might be lost as to where to start. Working with Stefan brought it all back though. However, I learned the most from spending that much time with someone of his stature in the art world. That was most invaluable. is/was enviable–i never could master the wet darkroom, it was a source of much dissatisfaction for me. When i participated in the Univ of Oregon Eugene workshop in 1967 with Ansel Adams, the Weston brothers, and Imogen Cunningham, we did field trips followed by darkroom work–i failed miserably. But there is no better rendition of photo images than film and paper when executed by a master, his son, and a new master! When i do digital black and white prints, i like to give them a warm tone, not unlike you speak about the Ilford paper. Hi Clark, thank you for sharing your experiences too. I sure like the look, feel and soul of darkroom silver gelatin prints, but I don’t particularly like the darkroom itself. It’s fun to do once in a long while to reminisce, but I don’t like the chemicals and prefer to work in Photoshop sitting down in a comfy computer chair. My back can’t take the long standing up time in the darkroom very often.